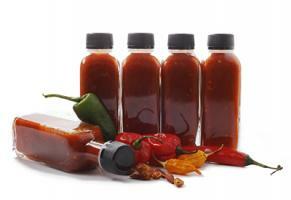 For the most popular hot sauce there is of course also a variety of chilli, from which the sauce is made. The Tabasco plant belongs to the genus Capsicum frutescens, it grows up to 1.50 m high and it produces many chilli peppers. As with all chilli varieties of this genus, the chilli peppers also grow upwards in the Tabasco plant. Originally the Tabasco Chilli comes from Mexico, meanwhile it is cultivated almost exclusively in Louisiana, because that's where the Tabasco Sauce is produced. In addition to its taste and heat, the Tabasco chilli is so well suited for the production of hot sauce, as it contains a lot of fruit juice despite a thin fruit wall. In the kitchen, these pods are used very rarely. They are almost exclusively used for producing Tabasco sauce. For the hot sauce, the Tabasco pods are crushed and mixed with salt. The mixture is then stored in oak barrels for several years while fermenting. Then the whole thing is mixed with vinegar and there you have it - the Tabasco sauce! Tabasco - More than a famous spicy pepper sauce! Tabasco is not only the name of a pepper sauce that has been known for almost 150 years, because exactly in these sauces is where the extremely spicy chilies of the same plant are found. The tabasco plant is mainly grown for the production of the sauce. Above all, the name stands for a real bestseller: The spicy sauce in a handy, small bottle is an export hit and is now sold worldwide with great success. Tabasco is not just a world-renowned sauce from McIlhenny Co., it's also a chilli variety. The plant belongs to the species of Capsicum frutescens and was first commercially cultivated in Louisiana in the USA. Their actual origin, however, is probably in Mexico or South America. The Tabasco plant is typically a bush where numerous fruits ripen to harvest. The yellow pods, which only turn red in the course of the ripening period, are about 4 cm long and run to a point. In addition, they grow upright. 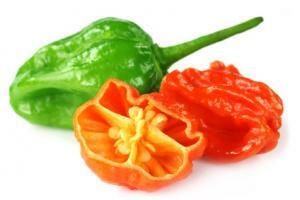 They have a high concentration of capsaicin and thus reach a Scoville value of up to 50,000 units. Meanwhile, the plants are mainly planted and grown in Latin America. After all, there they can have ideal growing conditions all year round, so that the production of the famous Tabasco sauce is continuously ensured. The seed for sowing originates directly from the first plants that were bred by McIlhenny Co. many decades ago on Avery Island. When it comes to cultivation, strict conditions apply, especially for quality assurance. Only fruits that have reached a certain redness may be harvested and crushed and added to the production along with added salt. The degree of ripeness is checked by hand with a corresponding colored stick. 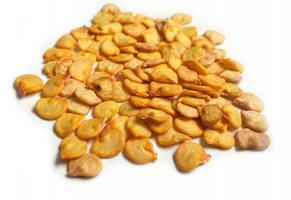 On the other hand, preservatives and artificial colors are generally not used. The popular taste, however, is mainly attributed to the fermentation process and the maturity of several years in oak barrels. And maybe that's the secret behind the success of the Tabasco Pepper Sauce. Anyway, the sauce is exported to over 165 countries. The main customers from abroad are above all the countries of Japan, Germany and Great Britain. But her triumph has also brought the sauce to the other end of the world - to Australia. Real fans naturally attribute this to their unique taste. Perhaps it is also due to the many well-known commercials in recent years, which remain well remembered because of their bizarre content. Either way, the success has been so great that numerous lawsuits have been filed for patents and naming rights. Accordingly, the "Tabasco processes" were aimed not only at the manufacturing method, which was patented in 1870 in favor of McIlhenny Co. Competitors also tried to use the name Tabasco for their sauces as they try to imitate the success of the sauces - from recipe to its distinctive design. From 1920, however, it was only reserved for the McIlhenny Co. to produce so-called "Tabasco sauce". At least the patent for the production has now expired and pepper sauces in the so-called "Louisiana Style" are increasingly being marketed. On the other hand, not only the number of manufacturers has grown, but also, the McIlhenny Co. has brought over the years a lot of variations of their classic sales on the market. The Green Pepper Sauce: Introduced in 1993 for the company anniversary, this sauce is not based on the pods of the Tabasco plant. It is made from Jalapeños and therefore has a slightly different flavor. At least according to the Scoville scale, it is also much milder. Garlic Pepper Sauce: After this, three years later a much milder sauce is introduced. It contains mainly garlic, but also cayenne, tabasco and jalapeños. The Habanero Pepper Sauce, on the other hand, is for those who like it fruitier. Although the Habanero chilies are well known for their extreme heat, together with mangos and other fruits, the taste of this sauce is considered relatively mild. Chipotle Pepper Sauce: A bit hotter than Tabasco, this pepper sauce is a real insider tip, especially when grilling. The smoked jalapeños from which it is made, gives it the perfect taste. Sweet & Spicy Pepper Sauce: From 2005, it got milder - you can tell that with the Sweet & Spicy Pepper Sauce immediately. It is considered one of the mildest sauces currently available on the market. The same applies to the Buffalo sauce with cayenne and garlic and it is available since 2011. It is very mild with 300 to 900 SCU, but also delicate. In addition to these variations of the original Tabasco sauce, many other products from McIlhenny Co. were launched. Often these are products that are produced on the one hand by other manufacturers, but on the other hand they also contain the original sauce. The Tabasco logo therefore also appears only as an additive on the packaging. 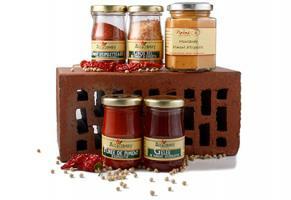 A corresponding selection of sauces variations and tasty alternatives can also be found in the Pepperworld Hot Shop! Tabasco Pepper Sauce - Where does the name come from? The McIlhenny Co. has achieved great success for over 145 years with their products. And not only because of the patents and naming rights! The Tabasco Pepper Sauce is the most famous chilli sauce in the world and extremely diverse. The name does not come from the plant. Just over 20 years after the market launch, the chili variety was named Capsicum frutescens cv. Tabasco was first referred to by the botanist E. Lewis Sturtevant. Company founder Edmund McIlhenny is said to have baptized his product Petite Anse Sauce first. The family was against it. So he chose Tobasco. The term is interpreted in front of everyone with the translation "land in which the earth is hot and humid". On the other hand, the name should refer to the homonymous federal state in Mexico. After all, this region in the period around 1868 was extremely active in maritime trade, because their location on the Gulf of Mexico was predestined for it. And this is where the seed with which the company founder has bred the first plants on the island Avery Iceland should have come from. However, the origin of the plant has not yet been finally clarified. 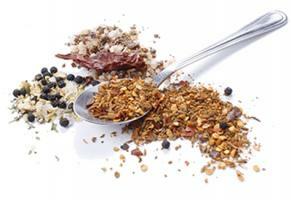 Edmund McIlhenny did not document the reference source during his lifetime and referred to it only as "pepper". The members of the fan community have in any case agreed: Tabasco fits in with almost every dish. If you allow yourself to trust the TV commercial at that time, even a blank pizza base with the sauce becomes a delicate challenge. And when barbecuing, in the snack bar or in the local kitchen - Tabasco simply must not be missing from any collection. In fact, Tabasco Pepper Sauce is also so popular in its home country, the United States, that it even became part of the supply rations for US Army soldiers. Of course, stylishly bottled in a miniature, whose design was based on the original bottle. But Tabasco has also found its way into drinks. After all, the sauce is an important ingredient for a cocktail classic: The Bloody Mary! Just combine tomato juice with vodka, Worcestershire sauce, some lime juice, lemon juice and a few splashes of Tabasco - ready. Served on ice as tasteful highlight - if necessary, also in the morning. Or how about a peppy cocktail as a smart dessert? Offer the Bloody Mary as a sorbet! Boil the sugar and water in a pot and simmer until a syrupy mass forms. Then add a pitcher of the cocktail with Tabasco sauce, stir well and place in the icebox of the refrigerator. Alternatively, you can of course also use an ice machine. The Tabasco Pepper Sauce from the McIlhenny Co. is definitely a classic for all-round use. And therefore, an original bottle must not be missing in any household. So you don't only own a traditional pepper sauce in the house - whether you use it for meat or pasta, or even for salad itself, a few splashes of your sauce will give each dish a peppy spice. Likewise, as an ingredient for cocktails, it gets your party going or it rounds off a successful dinner in sorbet. Even if the source is not clear, Edmund McIlhenny was not just lucky. His Tabasco sauce is still on everyone's lips almost 150 years later. This is perhaps no less due to any protected rights. But the taste is unique and the pepper sauce from the Tabasco chilies has a very special flavor. Above all, it is made exclusively with natural ingredients. After all, McIlhenny Co. guarantees that preservative and artificial dyes are also completely absent. Although the Tabasco Pepper Sauce does not break any records regarding heat. Over time, some variations have been added and it is worth to test them! In the Pepperworld Hot Shop you will find the most delicate varieties and the high-quality alternatives for those who like to try new things. And that's not difficult for Tabasco, because Tabasco is so popular nowadays that many cookbooks have included options in which you can use the sauce. Where there is written Tabasco, there is also Tabasco inside! Famous representative of the C. frutescens family. Everybody probably knows it, the Tabasco sauce, in its typical bottle, made since 1868 by the company McIlhenny. The basis of this world-famous sauce is chilies, which the company founder Edmund McIlhenny received as a gift, around 1850, from a stranger from Central America, allegedly Mexico. After several attempts with sauces, production began in 1868 - but only 20 years later, the cultivated chilli variety is first described by the botanist E. Lewis Sturtevant -namely as capsicum frutescens cv. "Tabasco". The seed for the plants has always been bred in steadily improved form as tabasco chilies by the company and distributed to the growers, but of course, due to the great popularity of these chilies, similar varieties, falsely offered under this name, are available for purchasing. What distinguishes a Tabasco chilli? Tabasco chilies are relatively small fruits with a much stronger heat than most Capsicum annuum chilies can develop. The plants grow bushy and stocky and have a sometimes-enormous yield, which makes them ideal for large production quantities, as both care and harvest are very easy to cover. Tabasco chilies can easily convince in terms of taste, are easy to process and versatile to use. In short: The Tabascos are real all-rounders. Something that brought celebrity to the tabasco chilies is the almost unique or at least noteworthy fact that the fruits are "juicy" inside, so rather wet than dry and some have a very soft pulp. Where do the Tabasco chilies come from? As already described, varieties used by McIlhenny are distributed in a kind of internal growing system. Originally the Chilies were grown in the US in Louisiana, today they grow mostly in Mexico - in the state of "Tabasco", which means in the language of the indigenous there as "land in which the earth is hot and humid" a perfect name for these chilies. Tabasco chilies belong, as mentioned above, to the species capsicum frutescens, whose origin is attributed to Central and South America. In the area of Central America, many other capsicum frutescens varieties are grown, such as Piri-Piri (which is often said to have come from Africa or India, but they were brought by the Portuguese to Goa in India and from there their obtained dissemination). Most of the available Tabasco varieties come in some way from the varieties that McIlhenny used or reused. For example, new crops had become necessary after much of the crop fell victim to the tobacco mosaic virus in the 1960s. As a consequence, the company developed the strain "Tabasco Green Leaf", which is resistant to the virus. While today McIlhenny produces a lot of sauces based on other chilies (and is the only company that is allowed to call these sauces "Tabasco Sauce", even though it was created on the basis of Habaneros, for example), the origin is and remains the Tabasco chilli. The fruits have a moderate heat of 30,000 to 50,000 Scoville and are thus about twice as hot as a cayenne chilli or half as hot as a habanero. The ripe red fruits have a comparatively soft and juicy pulp, which is due to the high moisture content optimally suitable for processing by fermentation, but it is also suitable for a variety of other methods of processing - for example, as a chilli paste. The fruits should ideally be cut open so that no mold can form inside. Similar to their direct relatives, the Piri-Piri, the Tabasco chilli can also be well sweet-and-sour, which, like the fermentation, also ensures that some of the heat is lost (Tabasco sauce has about 5,000 Scoville, in sugar Vinegar-soaked Tabasco chilies about 15,000 to 30,000 Scoville). If you let a Tabasco plant "run wild" it will usually develop to a small bush to about 1.5 m in height, on which hundreds of about four inches long fruit will grow. The flowers are whitish creamy with dark stamens and optically a mixture of c. annuum and c. chinense - who are also good crossing partners for c. frutescens plants such as the Tabasco chilies are. The small-leaved plants grow heavily branched and fall mainly due to the small leaf size compared to most other species such as c. annuum up clearly. The fruits grow upright and ripen from green to yellow to orange to red. In the oblong-pointed fruits are numerous yellowish-white seeds. The fruit ripens - if all Conditions are met - in real Tabasco chilies pretty fast. It takes about 80 days from flowering to ripe fruit. Of course, this is more than just an industrial use. In crop production, the plant receives a special trimming, which ensures that the plants grow evenly and thereby the harvest is facilitated. This trimming is also intended to help to increase the yield, therefore it is deliberately cut so that a bushier growth with a high surface to the sun arises. Tabasco: a mimosa among the chilies? 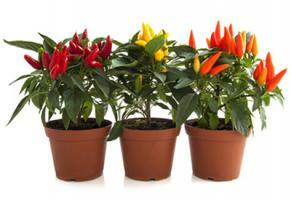 The Tabasco plant is a rather demanding plant compared to many other chilies, especially capsicum annuum. 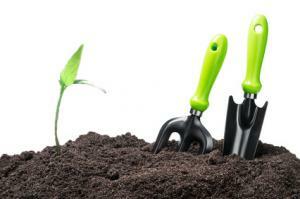 As indicated in the description of origin, "hot and humid soil" is a good indication of what the plant wants. This means: a loose soil, which offers good drainage capabilities, and consistently warm environment (at below 15 ° Celsius during the flowering period, the yields partly drastically break), regular water and above all: plenty of nutrients. In short - the Tabasco plant is a real mimosa, because it should not be too warm either, of course ... Ideal is therefore a sheltered, but very warm location (ideal are 25 to 30 ° C in the daily average with peaks not exceeding 40 ° Celsius) - whereby most (unshaded, unacclimated) greenhouses often fail. Even with the nutrients Tabascos tick something different than many conspecifics: Fertilizer should focus on potassium, phosphorus and calcium, too high of a nitrogen content lowers the yield. Depending on the initial fertilization of the plant substrate, an NPK fertilization ratio of about 1-1-2 would be desirable, contrary to the usual nutrient ratios for chilli fertilizer. It should be cast as well, unlike most other chilli varieties, not only when the plant is about to let its leaves hang, but at a constant rate. A Tabasco plant cannot "swim" either, but if the soil has the drainage qualities it should have, it will rarely be "too wet" anyway. As already mentioned, the Tabasco chilli is quite versatile. Probably the simplest way to use them is to cut them into fine rings or strips and to use them like a Thai chilli, as a spice for all kinds of food. Drying in Tabasco chilies is best done with tools such as a dehydrator, since the high water content accentuates the risk of mold growth. If you want to dry without tools, the fruits should be halved, so that in the humid climate that is within the fruit, no unwanted mold cultures develop. The same applies to the insertion in oil - it is better still to put dried chilies in the oil. From Tabasco chilli, it is popular to make a Sambal Olek-like paste: just chilies coarsely cut small, pound together with a little coarse salt in a mortar. Then stir in a little oil and the paste is ready. The "secret recipe" of McIlhenny cannot be revealed at this point. Of course, the basic method of production can. The patent for the method has already expired, which is why there are several manufacturers who produce in the same way. But first of all: puree chilies and tip vinegar, but that's not what makes the sauce so exciting. First, the chilies are washed, then the style removed. Next, the Tabasco chilies are roughly crushed and mixed with sea salt in the ratio 10 parts of chilli, 1 part of salt. This porridge can now be added in a small amount (about half teaspoon) either to organic cider vinegar or unpasteurized buttermilk as a "jump start". Whether you add it or not, the porridge should now come in an opaque container that can be closed with a loose lid (so that the air can escape, best used would be a fermentation vat). Before the lid comes on, it is recommended to spread a thin layer of salt over it, so that germs are inhibited. Now the mixture should be able to rest and ferment for at least three months (McIlhenny's is about 3 years old) in a moderately warm place (about 20 degrees). After completion of the fermentation process - depending on your taste - 1 to 2 parts of brandy vinegar (of course you can also experiment otherwise) are added to it and stirred well. With the lid closed again, the mass should be drawn through in the refrigerator for one to two more weeks before it is passed through a sieve and filled into sterile containers.